It’s super cheap and will run many of today’s most popular games, but is it worth building? I set out with one goal in mind; build the best $150 gaming computer I could with new parts. With a $150 budget, many PC elitists will write this computer off. My aim is different than theirs. Rather, my goal was to build a machine that anyone could afford. It would play the likes of League of Legends, Dota 2, Hearthstone, Minecraft, Counter-Strike GO, and WoW in 1080p while giving gamers the ability to play some more graphically intense games in 720p. Bristol Ridge is here, although limited so far, and Raven Ridge will certainly be an option going forward. However, We’re still happy with the Kaveri option we can afford for this build. Having lived in Brazil for a few years of my life, I know how expensive gaming can be. There, hardware costs about twice as much as what it does here in the US. Consoles are even worse. When the PS4 was released it cost an easy $1,850 while the Xbox One came in at a cool $1,016. Even with the low cost of consoles in the US and in some areas, consoles lack the ability to play many of the most popular games right now. No matter where you live if you’re looking for a cheap gaming PC to play your favorite games, here is the solution we’ve come up with. Keep in mind that using multiple retailers to shop will be key here. Also, depending on the month you purchase parts, you’ll want to look at alternatives for everything but the APU. Otherwise you’ll be wondering how to stay within the budget. As rebates change monthly part of reaching this budget is on the builder but we will add suggestions as we see them. See Newegg Price You might be tempted here to go with the A4-7300 or A6-6400k. Instead, try to find the next generation A6-7400k Kaveri with R5 graphics for around the same $50 price tag. See Newegg Price A micro ATX motherboard with a lot to offer including a couple USB 3.0 ports in the rear I/O and an HDMI port. See Newegg Price This is a great little case available for as little as $20. Includes a front 120mm blue led fan. Keep in mind, the front I/O has a USB 3.0 port that is not compatible with the motherboard we've chosen. A cheap connector will allow you to connect it to USB 2.0. See Newegg Price Cheap and Good 80 Plus PSU that should last a long time. There are cheaper options out there, but few which I'd trust. The deal $25 after rebate deal I found on NCIX.us. See Newegg Price The budget here only allows for around $25. That being said it doesn't make sense to go with 1x4 for performance. Stretch for a 2x2GB kit or stretch further for 2x4GB. See Newegg Price Cheap, fast, and reliable. For the most graphically intensive games, it’s more than likely this computer will fall short and that’s ok. Why might you ask? Those who can only spend $150 on their PC aren’t looking for $60 games like Witcher 3 or Batman Arkham Knight right now. If they had $60, they’d probably upgrade their hardware. Still reaching for 720p on some of these titles should be attainable. In addition to my gaming goal, I wanted this PC to have a small form factor and be able to double as an HTPC, Steam PC, or emulator rig. While I feel that I’ve met parts of that goal, you’ll have to be the judge of that by looking through the parts and benchmark section. Your comments on this build are appreciated as well. When pricing this build out, I had to save the GPU and CPU for last to see exactly the type of budget we were working with. For me, the budget worked out to be right around $40. While a good budget CPU-GPU combination would be the G3258 and the R7 260x for our $300 Gaming PC build, at this price point such a combination is out of reach and would cost more than our entire budget. We’ve also been able to incorporate the new Ryzen 3 1200 into a $500 build. The only CPU-GPU combination I could come up with that was even close to the budget was an Intel Core 2 Duo E8400 with a Radeon HD 6450 for about $48. As I didn’t want to work with that older socket and the HD 6450 had a lower base frequency than the HD 8470D, the A4 7300 APU seemed like a solid option here for $40. Also within close reach of our budget is the $50 A6 6400k and A6 7400k. Both of these options are slightly out of our budget and while it would have been nice to have an unlocked processor, we have no room in the budget for anything but the stock CPU cooler. Without a CPU cooler, the 6400k holds little extra value over the A4 7300. R5 graphics with the Kaveri A6 7400k would be a good step up and is definitely something I’d recommend as you can occasionally find it for the same price. This would give you benchmarks in excess of what I show below with the A4 7300. The Athlon 5350 with R3 graphics is another option near our budget. It includes R3 Series graphics and 4 cores rather than 2; however, since we’re looking for the best graphical all-in-one solution at this price point, it doesn’t fit the bill. 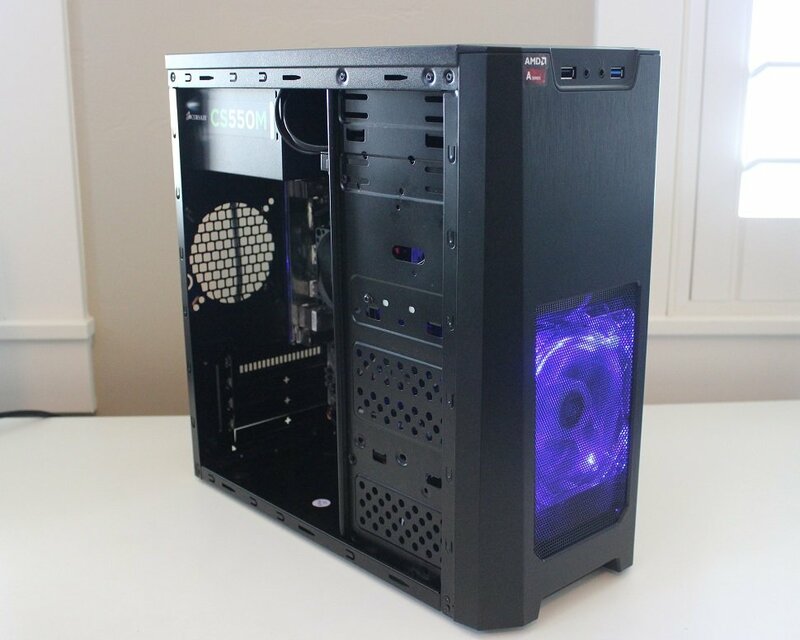 The Xion mATX case looks surprisingly good for $20. 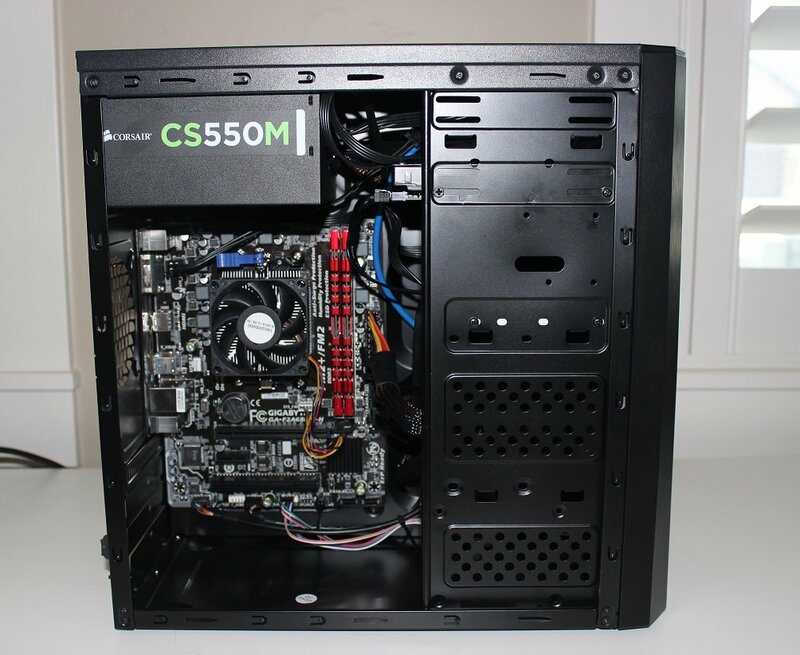 For case, we chose something cheap that could handle a Micro ATX motherboard solution. The Xion mATX came in as low as $21 from Amazon with free shipping at the time of this article. I knew beforehand that the front USB 3.0 header was not compatible but that everything else would be. In addition, the case came with a 1x120mm Blue LED fan that not only looked good but would have cost nearly half the price of the case if bought separately. Having worked with this case at this point, I can tell you that it did not disappoint. It was more sturdy than other budget micro ATX cases I’ve used in the past. If I had a complaint, it would be that the power supply was top-mounted and that the drive bays didn’t have any easy-to-install solution. That being said, I was still able to screw my drive into the side of the case. It’s important with this build that you improvise where necessary. 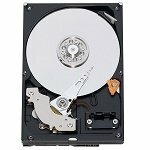 The Rosewill FBM-01 is another good option here if you can find it cheaper. The Rear I/O from our motherboard gives us more than I could have hoped for. A couple of USB 3.0 ports, 4 USB 2.0 ports, and even an HDMI port. Having only $30 for the motherboard, I was thrilled that the Gigabyte GA-FD2A68HM-H was $30 after rebate. I’m very familiar with Gigabyte’s boards and BIOS and have had little trouble with any of their boards in the past. Depending on when you build this you may need to do some checking around. The Biostar Hi-Fi A70U3P is another cheap option. This board has a couple USB 2.0, USB 3.0, and even an HDMI port in the back which was the perfect fit for our budget build. I did have trouble getting my RAM to go above 1600MHz even the board is technically compatible with DDR 2400 (OC). I used two different sets of RAM and had a similar problem with each when both were 1866 memory. I’m not positive that this was a motherboard problem; however, it is worth noting. Still, I’m pleased with what I got for $30. The motherboard I listed above continues to be on rebate for around $40. To achieve the $150 price, you may also need to look into other options like the MSI A68HM-E33, Biostar Hi-Fi A70U3P or Asus A68HM-E. Here are a few FM2+ options so just look for something on the cheap side of things. If you’re able to find something cheaper than what I found, be sure to let me know. For storage, I’m using a 250GB Caviar Blue drive from Western Digital. I was able to find this for a total of $15 at the time of this build. If this drive isn’t available continue to look around. I was able to find the Western Digital 250GB Intellipower for a similar price. For Ram, you’ll want to take advantage of dual-channel memory which makes a big difference for APUs. For the purposes of this build, I tested a 1×4 and a 2×8 configuration which you can see below. While the 2×8 configuration is out of our budget range, I thought I’d emphasize the importance of dual-channel memory here. At around $13 for 1x4GB, $20 to $25 for 2×2 memory, and $25 to $30 for 2×4, you’ll want to spend the extra cash for the 8GB if you can. Some basic Crucial 8GB 1600Mhz desktop memory was the cheapest I could find at as low as $26. While I’ve listed what I think are the best power supplies for the money in a previous article, it’s important to pay attention to rebates. I was able to find an 80 PLUS certified EVGA power supply from NCIX.US for $25 after rebate. While I used a Corsair CS550M that I already had lying around for my test build, the 500 Watt EVGA solution is more than adequate. If the 430W version of the EVGA PSU comes available for cheaper, it may also be a way to trim the price of this build. Recently, I also found the Rosewill 550W Bronze edition available for $10 after a $25 rebate. So, look closely and you might find even better deals. Other cheap power supplies to look at include: the Corsair CXM 450, Corsair Builder Series, and Rosewill ARC series. My Benchmark testing involved Tomb Raider, Battlefield 4, Bioshock Infinite, and CS:GO. As you can see Tomb Raider, Bioshock Infinite, and CS:GO are all very playable. While Battlefield 4 shows an FPS of 40.2, I wouldn’t recommend this APU for that game. My benchmarks were taken from various multiplayer maps which were plagued by stuttering and artifacts. Turning down the resolution scaling can get rid of all of this, but overall it’s a game I’d avoid. I also tried it in a 1x4GB configuration which was too painful to finish benchmarking. 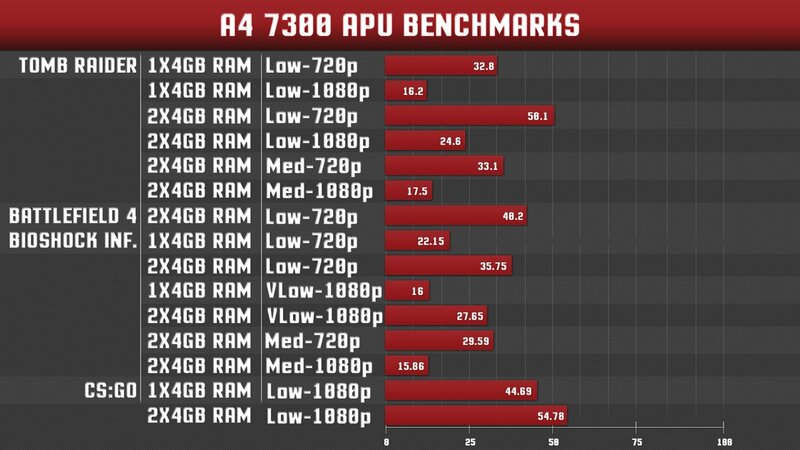 Overclocking the APU could have given me some potential gains here; however, without a proper CPU cooler, I had my doubts about its long-term effectiveness. As I mentioned above, overclocking the RAM was less than successful with this setup with the two sets I tested with. Even using the XMP profile gave it issues. Troubleshooting this more could have potentially led to results which would give even more frames. I could have benchmarked other games as well; however, I think you can get a lot from the graph above. Other games like Skyrim, Diablo 3, LOL, and Hearthstone should be playable. Admittedly, this build goes over the $150 mark by a slight margin if you go with the 2×2 ram I’ve suggested in the table above ($160). Considering the performance implications of going with 1x4GB, I wouldn’t recommend that anyone go that route. Then again, our performance benchmarks show us using 2x4GB of ram so that’s another shortfall. Still, it’s the dual channel memory option that gives AMD’s APUs the fuel they need. In the under $200 category, you could also go with the A6 7400k or even the quad-core A8 7600 and have 8GB of ram within that budget. Still, at some point in the higher-end of the spectrum, APUs stop making sense to me and low-end dedicated graphics cards and CPUs make more sense. At this budget, APUs truly do make sense. An affordable CPU/GPU solution for those with a light budget. Nothing wrong with that. In fact, when I was a kid I remember upgrading the stock computer my parent’s had bought, a Packard Bell Navigator, with a GPU, RAM, and whatever I could to make games like Master of Orion work. I don’t fault anyone for working with what they have right now. Still, the Battlefield 4 player in me yearns for more. In fact, this entire review is coming from a guy that wants to play games like The Witcher 3 and BF4 at Ultra in 1440p. I’ve slowly evolved into a high maintenance gamer. But, I guess you have to start from somewhere. Thoughts? Will this PC let me play games on discs? 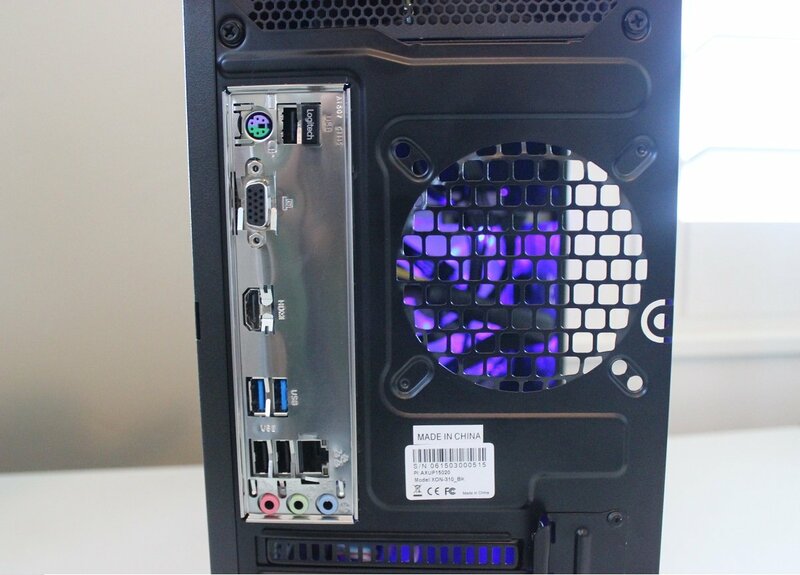 Will this pc be able to play: CSGO,Roblox,Minecraft,League,Brawlhalla,Paladins and maybe some horror indie games? I’d go with something under $100 for sure maybe R7 250? What games are you trying to play? What CPU cooler did you use? Following this, i went easily into the $200 range which i cant afford. even using the reccomended cheapr options till put me at around 180, which i cant afford. i dont understand pc building at all and ill just wait till i have a thousand dollars and buy something then. For this build, prices can vary drastically from day to day based on small changes. Unfortunately, you have to look for a few weeks to get just the right combination to be in that price range. Hello very interested on this . can this run Blade and soul mmorpg smoothly ? I’m going to build my version of this with twice the ammount of ram and memory. Just wanted to make sure it will work. I’m also getting a keyboard, mouse, and monitor; and my total cost is $268.01 off of amazon. Would getting the AMD A8-7600k Quad-Core 3.1GHz Socket FM2 be better than the A6-7400k APU Kaveri? but what graphics card did you use? Could you possibly post a build video? Im new into PC building and I could really use some help! At the end of you’re video you said you might sell these? Could I buy a prebuilt one for 200? With the Kaveri apu, maybe 230? And you send it over? Maybe PayPal or something, it’s a Christmas present I’m thinking. Unfortunately, I’m still waiting on AMD to release these to the public. Might be a little while. Hello! I was wondering if i could get a full link of all the items that you used for this build i want to build it for Christmas! and if the listed items above when i buy them and get them all thats all i need to buy right? im new to building pc’s so my second question is if i buy the already listed items i will have a pc when i build? another question is can i replace the gigabyte motherboard with the s1 version of it? I’m not really sure what you mean by this, it is using the APUs integrated graphics. You can even use a dedicated GPU with it as well. I just noticed this comment. Sorry for not replying sooner. What speed is your ram set at? Try downclocking it to 1600 – also try putting in one stick at a time. Let me know if that works. Is it possible to get a $50-$100 Prebuilt pc add a $100 graphics card and play GTA5 if not ill get a console. Yes it is. If you can go used and new parts you could do that easily. I have an EVGA GTX 560Ti, cheap recommended motherboard? or can this motherboard do the job? Is a 500W EVGA Power supply compatible with this build? OR does it need to be a 430W power supply? Can this build run SteamOS? Any where that will build this for me? I’d build it for you as long as you buy the parts. So, I’ve spent the past 3 days looking for a good review or example of a DIY PC using APUs in this price range. Thanks so much for doing this. Most seem to immediately reject the build. I found a discounted openbox for that motherboard at under $45 and since I’m going to use Case, PSU and HDD from my previous build I’m putting the extra savings into 2x4GB ram and the A6. Still around $146 with taxes. What a great little build not going to win any awards for perf, but will run many games and be a more than adequate livingroom PC. Ya, it’s surprising how well it does – throw in a $35 120GB SSD and it’s actually really snappy. Okay I figured out it isn’t, so what usb adapter should I purchase, still staying in a budget perspective. I want a usb wifi adapter because they are so much easier then the other options and a good plug in and go type item. Is this ethernet cable only, or does this come with wifi. Im not computer savy so I don’t know how to tell. I need it to be wifi compantible because my router isn’t easily accesible. pair an AMD 7870 or cheaper card with a used DELL t3500 workstation on ebay! $250. Run games on high instead of low…this is what i did. Hi, I have a question. Do you need to buy a monitor? And how much would that come out too? And also I’m a college student so will it run like office programs and Quickbooks ? Would this be suitable to run Minecraft at least? This would be primarily for my 8yo son and for using for homework, watching netflix etc. Here’s what I came up with… It’s a $200 build with an 8GB ram and a 1TB HDD instead, also I dissed the branded PSU and went with a built-in one, since it’s a Cooler Master anyway, I think it would work better than other generic PSUs. Your thoughts? but we do have GIGABYTE F2A68HM-DS2.. does this mobo still works here? Could it be a good substitute? Thank You so much! It’s a perfect combination and I think I’m going to build this one. This would be good to build for my kid that is 10 whom I know really wants a pc of his own for games. This would work great on most Steam games. He likes games like Portal and Minecraft. This would be good for a kid that has saved his christmas money and allowance to build something that can do minecraft and cs go.